Foster Mother of George V Living in Dire Poverty. Hopes Sovereign She Mothered Will Provide for Her. Daughter Died While She Was in Attendance on Great Britain’s Future Ruler. PITTSBURG. Pa., September 10. Mrs Ann Roberts, foster-mother of George V, King of England, has been discovered in poverty here. Mrs. Roberts lost one of her own babes through her attendance upon the infant prince. The royal physicians and retainers would not inform her of own child’s Illness for fear the milk with which she was nourishing the future King of England might become feverish and do him harm. Mrs. Roberts at the suggestion of friends, is writing the English sovereign of her condition and asking some recognition at his hands for what she did for him as an infant. Mrs. Roberts Is the mother of Capt. Henry A. Roberts of the Volunteers of America. She is a native of Wales. She has been living for the past several years with her brother, Richard W. Edmunds of Nunnery Hill, North Side. She was a member of the royal household of Great Britain for ten months and three days. Her own child died in the night without her knowing that she had even been ill. Mrs. Roberts is the only woman in the world who ever nursed the King of England, including his own mother. Mrs. Roberts went from Bethesda, North Wales, when quite a young girl to seek service in London. She was eventually married there. Her husband was a respectable tradesman, residing close to Buckingham Palace. They were happy and prospered. Among their friends were some of the most influential Welsh people in London. Among these was a Mrs. Jones, then of 20 Hills street. Knightsbridge, also a Welsh woman. Mrs. Jones was a great favorite with the late Queen Victoria, under whom she held authority to select and engage all the domestics for the royal nursery. Mrs. Roberts was then a comely young matron, of splendid physique, and in the enjoyment of perfect health and a robust constitution, which had been developed while romping as a girl over the rock-bound and heather-clad hills of her native Wales. Mrs. Roberts was at that time about to become a mother. She knew, as did all Britain, that the then Princess Alexandra had similar expectations. Mrs Roberts had a dream in which it appeared to her that she had been selected to nurse the expected child of royalty. Within a day or two thereafter, not then knowing the full extent of Mrs. Jones’ authority, Mrs. Roberts called on her and related her strange dream, and told her also of her seemingly impossible ambition. The surprise of Mrs. Roberts may be imagined when Mrs. Jones informed her that if it was her wish she would then and there appoint her to the position, provided, of course, that the royal physicians approved of her choice. After the birth of her child, a beautiful girl baby. Mrs. Roberts was ordered by a royal messenger to call on Dr. Farr, one of the royal physicians, in Harley street. Mayfair, who, after a thorough examination and many questions as to family history, pronounced Mrs. Roberts to be in every way fitting to become the foster mother of a royal prince. Mrs. Roberts then applied for permission to spend a few days at her old home in Bethesda, in order that she might see her brothers and sisters and visit the graves of her parents. She had intended to leave for Wales the last day of May, 1865, but becoming uneasy lest her services might suddenly be called for, she hesitated, changed her mind, and finally abandoned the trip. “It was well that I did so,” said Mrs. Roberts, relating the strange story of her entrance upon royal service, “for on the night of June couriers were sent to Bethesda to fetch me at once. Mounted messengers scoured the hills around my old home all of that night in search of me. My people in Wales, who knew nothing of my appointment, were thrown into consternation and terror. Royal couriers implied nothing but terror to them. They probably concluded that their poor Ann had committed some terrible crime. “All of this time I had remained in London, and the city bulletins had informed me of the state of affairs I reported for duty at 10 o’clock on the morning of June and began immediately to nurse and to mother the little baby prince, George. I had left my own child in the care of an older sister, who was to manage the household and dairy business for my husband while I was away. A few days after my departure my own baby was taken ill. It pined for its mother, but I was not acquainted with the fact. One of the doctors of the royal household called to see her each day. The child died on the eighth day without my even knowing that she had been ill.
“I will never forget the hour that I was told that my beautiful child was dead. The cruel news brought me to my knees on the floor of the royal nursery. The splendor of my surroundings appeared to me as so much dross. It seemed to me that I had been turned into a block of cold marble. The loss of my own beautiful child had that effect upon me regarding the little prince that I soon grew almost to believe that he was truly my own child. I was kept in this position just about one year. When my services were no longer required King Edward, then Prince of Wales, sent for me from the nursery to tell me that I had not only won his own esteem, but that of his beautiful Alexandra, and that I was also esteemed and respected by the royal household. Mrs. Roberts’ old friend, Mrs. Jones, was again able to help her by securing for her the appointment to nurse and foster the first born of the Princess Christian, at Cumberland Lodge. Windsor. Windsor. The popularity of Mrs. Roberts was at once securely established through her connection with the royal nursery. In the years that followed she nursed the Duchess of Abercorn. the Duchess of Iniskillen, the Countess Lutzow, Lady Vivian (now Lady Swansea), the Lady Church and many other among the noble dames of Britain. She has served at Windsor Castle, where to Welsh people of a few centuries ago entrance was far easier than exit; at Marlborough House, Balmoral Castle. Buckingham Palace, Osbourne, Osbourne, Sandringham and Cumberland Lodge in the discharge of her professional duties. After this long tenure of service Mrs. Roberts at last became so deaf that she did not feel longer competent for the work and declined to take on any new cases. She was then appointed to the Royal Maternities Charities Society, an institution organised by the then Princess Alexandra, now the beloved Dowager Queen of England, and controlled by her and a committee of London ladies. This position Mrs. Roberts held for several years, when, owing to her advanced age and the dangers and hardships of obeying calls In the poorer districts of London at all hours of the night, she resigned of her own accord, the secretary saying to her that she was leaving with an exceptional record of success and that her name should always remain on the roll call of the society. It is a source of great pleasure to Mrs. Roberts now to know that her name remains living and green in the heart of the field wherein she laboured so long and so diligently. 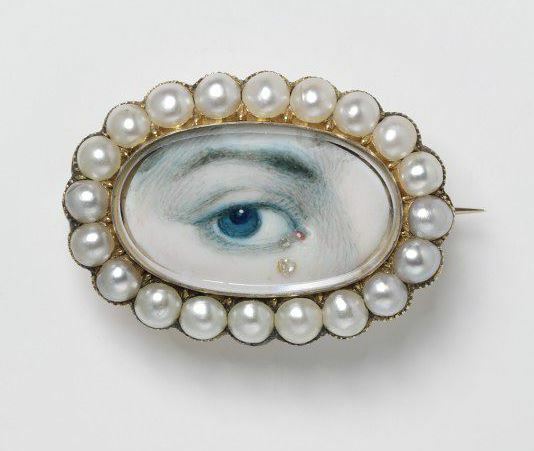 She also has another brooch, presented to her by the late Queen Victoria upon the christening of Prince George. On being called to Osborne on another occasion Mrs. Roberts was presented by the queen with two beautiful photographs, with her signature, one of herself and one of the deceased prince consort, informing her at the same time that they were the best photos ever taken of both. These Mrs. Roberts left with a relative on the other side. She says that as poor as she is their weight in gold would not buy them. She did not care to subject them to the hazards of travel. Mrs. Roberts states that when Sir Arthur Bigge is appointed keeper of the privy purse she intends to appeal to him for a statement of her case to the king. She believes that Sir Dighton Probyn, who held this position under the late lamented King Edward, would never allow her protests and supplications to reach his royal master. Mrs. Roberts believes that if her petitions had been presented some action would have been taken on her case long ago. She claims to have some of Sir Probyn’s official letters now in her possession, possession, in which he is alleged to state that nothing could be done for her. Mrs. Roberts gives it as her belief that these are solely the words of a mercenary. She says that King Edward had ever a kind and grateful heart, and was always good to old servitors. Mrs. Roberts was treated with every consideration by the royal household. She was several times invited upon the royal carpet. She enjoyed many pleasant chats with the late Queen Victoria. Sometimes, upon receiving Welsh newspapers, newspapers, the queen would send for her from the nursery and request her to read selections from them and to translate them. She would ask Mrs. Roberts to pronounce some Welsh words and sayings, and she would utter them after her, doing it far better. Mrs. Roberts says, than some of the young Welsh Americans whom she has met since being in this country. Mrs. Roberts saw the queen in her grief for her beloved prince consort. On one occasion she invited Mrs. Roberts to visit the grand mausoleum wherein rests his remains. She gave Mrs. Roberts the golden key which opens the door thereto, and sent her head dresser to accompany her, graciously saying that she would meet her there at a certain time. Mrs. Roberts says she will never forget the hour she spent there with the widowed queen and the mortal remains of the consort and husband whom she had loved so deeply. “I have been formally presented to the Empress Frederick, mother of the present Emperor of Germany, and also the Grand Duchess of Hess.” continued Mrs. Roberts. Roberts. “and I have many times attended the different ladies of the family to their balls and parties. These royal ladies know very well how to show little marks of esteem to favorite servants. I have had them more than once hand their fans to me to hold while their own ladies in waiting would be at their elbows, and, to their credit be it said. I never saw any of these ladies in waiting evince any sign of displeasure at such marked favors. “All of Victoria’s children, with the possible exception of Princess Beatrice, were very affable and chatty with servants and dependents. The Princess Beatrice (the youngest) was brought up under somewhat different surroundings from the others. Her good father was taken sick while she was yet a child in arms, and she grew up to be the daily companion of her sorrowing mother. This, I always thought, was the reason for her being more reserved and distant than the other children. “When I was nursing the Duchess of Abercorn the Princess Alexandra came in person to call on her friend, and was surprised and pleased to find me in attendance. It was our first meeting since my departure from her service. She greeted me warmly and shook hands with me, as would any good woman, and made inquiries as to how I was getting along. I was also all impatience to ask questions regarding the little prince and was tempted to tell her how much I should like to see him. I knew he was by this time quite a boy, big enough to romp and play with his elder brother, Prince Albert Victor. “On leaving the princess called for me and told me that, if such was my wish, she would arrange with the Canon Dalton, then tutor to the princes, for him to accompany them on an afternoon visit to me in a day or two. They came, and I had my hands full for that afternoon. They romped and blew soap bubbles, as would any pair of ordinary healthy boys, and both had a splendid time, untrammelled by court etiquette and unwatched by tutors. “The late Prince Albert Victor once asked his royal mother why Prince George was ‘my boy’ any more than himself. He was answered that he would be told when he became a man, and that he was to understand that Mrs. Roberts was his dear friend also, and that she had been very good to him. “When Prince George was elected chancellor of the University of Wales, at Bangor, he caused his private secretary, Sir Arthur Bigge, to send me a letter of invitation to attend the celebration. I had at that time a very important and serious case of nursing on my hands, and so sent my son to represent me. I have always regretted that I was unable to attend, for I lost there an opportunity of meeting the boy whom I love so well. Mrs Daffodil’s Aide-memoire: Mrs Roberts is a good deal more charitable to her former employers than Mrs Daffodil would have been. Gold brooches and watches, no matter how heavy or suitably inscribed, are, indeed, dross, when it comes to the death of Mrs Robert’s daughter and the doctors’ odious decision (based on the mistaken belief in “maternal influence”) not to tell Mrs Roberts that the tiny infant was ill and pining for her mother. It is possible that the child was ill with a disease untreatable at the time, such as diphtheria, even had her mother been able to nourish her, but at least Mrs Roberts would have been there to hold the child in her last moments. For the Royal physicians, the phrase “special place in Hell” springs to mind. In the interests of space, Mrs Daffodil will omit her trenchant remarks on the “favour” shown to Mrs Roberts by the ladies who condescended to hand her their fans to hold. This entry was posted in Aristocracy, Children, Death, Edwardian, Gentlemen, History 1910-1930, Medicine, mothers, News and Announcements, Professions, Royalty, Victorian and tagged King George V, Mother's Day, Mrs Ann Roberts, royal foster-mother, royal wet nurse, Welshwoman, wet nurse on May 13, 2018 by chriswoodyard. “Cress,” the gossipy correspondent of the Chicago Inter-Ocean, has discovered in New York a profession hitherto unknown, which she describes in the following letter. BLACKENED OR BRUISED EYES MADE NATURAL instantly; skin disfigurements concealed. Ladies, send for artist. Studio, 28 West Fourth street. “Five dollars,” was the answer. But, deuce take it, I haven’t a fiver left; but take this until I call for it,” and he thrust upon the artist a handsome pearl scarf-pin. “Now, what can I do for you, ma’am?” queried he of the brush, after a disappointed look upon my unblackened countenance. Whereupon I explained my mission, and the artist, not averse to the idea of being written up, assented to my staying awhile to take notes. “For,” said he, “the day after a holiday I always do a rushing business.” Scarcely had he spoken when a little lady entered. She was modestly dressed in black, and had a rather pretty face, though terribly disfigured by a deep semi-circle of black and blue under one of her eyes. She seemed a little embarrassed, and was profuse in her explanations of how she came by it. The lady, after careful examination, expressed herself satisfied, and inquired the cost. “Two dollars,” said the artist, considerately, after a glance at her modest toilet. This assertion, coming after her profuse explanations, had a very comical effect, which she was quick enough to perceive, and without further parley, she put down the money and departed. When the door closed on her your correspondent inquired if the artist had many lady callers. “Oh, no; I have two gentlemen in the business with me, and I devote most of my time to portrait painting. Barrett, Booth, McCullough, Florence, Sotherns, Raymond, Pope, Brougham, and others have sat to me. McCullough I have painted four times,” concluded Mr. Lysander Thompson, for such is the artist’s name. Before leaving, I asked from what class of men he drew the largest number of blackened-eye customers. “From sporting men and wealthy business men. The latter class, of course, would be injured by being seen with such disfigurements. There is one gentleman on Wall street who has hardly missed a visit to me this year. Every Saturday night he starts off on a tare that lasts him until Monday morning, when, bright and early, he comes here to get fixed up before going to business. One funny case I had last winter when two gentlemen conspicuous in the management of the Madison-square Garden, got into a quarrel, in the course of which one had both eyes blackened; the other only one. He of the two black eyes came here to be painted over, and told me if I would refuse to fix the other man’s eye he would pay me three times what it was worth. This I promised not to do, and in consequence the worst punished of the two men went round boasting how he had come out ahead, as no one could detect his bruises. The ridicule fell on he of a single and apparently blackened orb. This entry was posted in Aristocracy, Crime, Fashion, Gentlemen, Grim and Grewsome, Husbands and Wives, Irregular Lives, Medicine, News and Announcements, Professions, Victorian and tagged beaten wives, concealing makeup, demimondaine, domestic violence, makeup, painting black eyes, portrait painter, Victorian domestic violence on April 5, 2017 by chriswoodyard. A fantastic “Imperial secret” that had its inception on a New York farm, and its conclusion in the courts of the Romanoffs, was told on March 14 in New York after twenty years of silence by Edward Hatch, a New York merchant, former member of the firm of Lord and Taylor. Eighty-five per cent of all the animals born there were males, said the paper. Bulls that might have sold for thousands of dollars went to the butchers because the market was flooded. All the chickens were roosters. Even the turkeys and carrier pigeons suffered from the hoodoo. The house had seven kittens, and six were toms. A hired man and his wire on the farm had five sons. Even the corn would grow only on stubs, and scientists said it was male corn. Soon after this story was published, Hatch now said, a stranger questioned him about it at his store. He wanted an explanation. Hatch said he thought it might be the water, which analysis had shown contained much phosphorus and magnesium. The stranger then introduced himself as the Russian Consul. He wanted a sample of the water, and Hatch agreed. Mrs Daffodil’s Aide-memoire: Mrs Daffodil feels that this is as good an explanation as any, although, alas, young Alexis was born to sorrow, haemophilia, Revolution, and an untimely death. 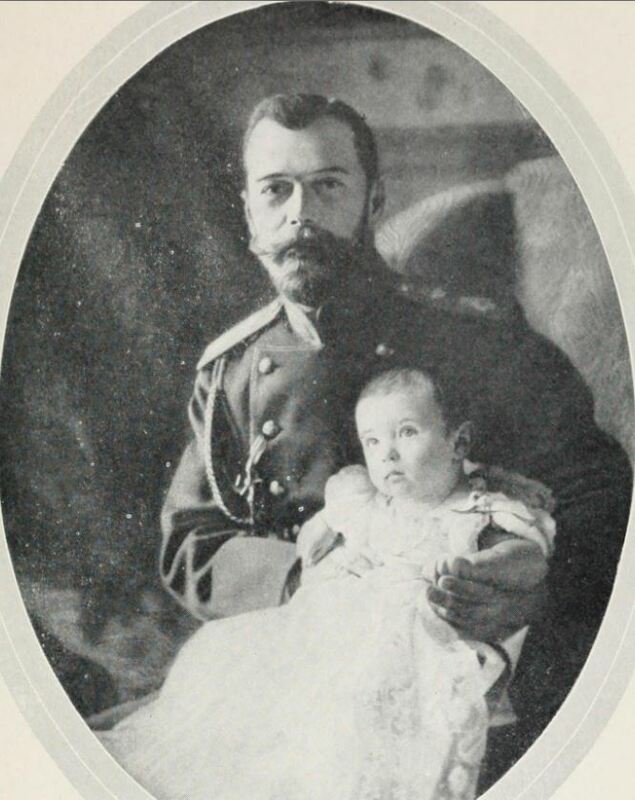 This entry was posted in Children, Edwardian, Medicine, News and Announcements, Royalty, Wonders and Curiosities and tagged Alexei Nikolaevich, Edward Hatch, House of Romanov, Romanoffs, Romanov heir, Romanovs, Russian Imperial Family on January 8, 2017 by chriswoodyard. Mrs Daffodil will caution the sensitive that some may find this post (and its illustration), which is about French soldiers disfigured in the Great War, disturbing. A powerful car, marked with large white initials, U. S. A., called for me to begin my series of visits to the principal establishments of the American Red Cross in and around Paris. I was shown to-day one of the most ingenious and touching things that has arisen from the war, which if it has developed means of destruction to a degree hitherto unknown, has, on the contrary, exalted to sublimity acts of devotion and the divine art of healing sorrow. We crossed Paris and reached that part of the Rue Notre-Dame-des-Champs, which, with its little houses behind gates hung with ivy and glycin, recalled a corner of our calm Provinces, where, in similar dwellings and silent gardens, grow the virile virtues which our race has proved to the world—to the world that knew only its superficial and glittering side. The motorcar stopped before one of these homes, well designed to shelter the dream of a thinker and artist. “Here is the studio of Mrs. Maynard Ladd, under whose direction the masks for the wounded are made.” said Miss Farrand. We followed an alley between two walls covered with vines and entered a room where one noticed only plaster casts and molds, the habitual equipment of a sculptor’s studio. From thence we climbed three flights up to Mrs. Ladd’s private studio, and at first saw but a vast bay-window showing a sunlit perspective of sky and foliage. Several people were working here, and I was presented to Mr. Wlerick, the sculptor, Mrs. Ladd’s collaborator. As Mrs. Ladd was at Vichy, he courteously placed himself at my disposition to furnish me all details of interest. My sincerity was obvious, my astonishment so complete that I was not conscious of it. The poilu was overjoyed, saluted and went out; shortly afterward I understood why my simple words gave him such keen pleasure. On one side of the large bay-window that lighted the studio numbers of plaster molds were lying. I started forward to see them and stopped, horror-struck. It was almost impossible to discover human lineaments in these casts that, nevertheless, represented poor martyred faces which had been serene, often beautiful, almost always smiling from being loved, from being young, and having all the future before them, and which were now but terrible formless ruins, something indescribable, “which has no more a name in any tongue.” There were noses torn off, twisted lips, disfigured chins and crushed foreheads—the whole gamut of deformity. A plaster negative on the mutilé. A plaster positive on the mutilé. Modeling after a photograph prior to the wound. and 5. Plaster molds on the portrait model. Galvanoplastie (deposit of sulphate of copper by electricity). Work of adjustment upon the blesse. Unalterable painting upon the mutilé. Placing of artificial eyes, lashes and brows. The sculptor indicated a plaster mold which seemed a strange animal head and which would have appeared to be a caricature had not we compared it with the corresponding cast which showed the head reconstructed. For this terrible deformation was due to the absence of the whole lower part of the face, and I had not even guessed it! I understood now why my unthinking compliment had so delighted the poor soldier! Upon further inquiries I learned that the invention of the mask is due to Captain Derwent Wood, of the Second London Hospital. Mrs. Ladd adopted it as it was first made, but it has been since developed and perfected. The first masks were necessarily heavy and quite different from the models of delicacy and lightness which were shown to me. The masks, if need be, may contain a dressing and are indestructible; if the wounded is careful they will last indefinitely. They are made at the expense of the American Red Cross, and the painting upon them has been rendered completely unalterable. I approached another soldier who was seated in the center of the room. Standing beside him an artist, a colleague of Mrs. Ladd’s. was moving a paint-brush across his cheek with a light, gracious movement that would have seemed a gesture in a game if one had not known, as I had just learned, that this motion on the wretched wounded face represented the height of art and love. At this moment the painter was giving the finishing touches to the indefinable bluish tone that the razor leaves upon a close-shaven cheek. It was unbelievably natural, and one would have to be informed that it was not a face fresh from the hands of a careful barber, but rather an extraordinary imitation of a human visage. “Oh, it is fine; it is splendid! How they should bless you, these young men!” I cried, considering by turns the soldier beaming with pleasure and the artist, who stood there as modest as though she had accomplished the most ordinary work. “Certainly they will never forget you; you make them again the lovely boys they were before their wounds; you give them back all the joys of life, all the possibilities of happiness.” Ah! how he looked at me, the poor poilu so terribly disfigured. I am sure this boy, tried beyond human endurance, was upheld in his adversity by the tenderness of a dream, and for him this mask, which hid so admirably his fearful and glorious misery, was the Mask of Love! I was delighted with this sudden thought that came to me; then I smiled, for what I had believed to have been an inspiration was only a memory. The Mask of Love is the title of one of the most famous books by Daniel-Lesueur. Still filled with my idea. I continued, “Listen, I have an inspiration. I owe it, moreover, to your modesty. I shall call the article which I am to write concerning you the Mask of Glory, because it is, indeed, your glory you mask!” There were many exclamations around me, and Mrs. Ladd’s collaborators approved heartily. Dear Madame: I am so greatly satisfied with my mask that I cannot wait to come to thank you again. My parents, too, are very happy to see me as I am. When I arrived they scarcely recognized me as the same wounded man. Also the neighbors wondered how it is possible for one to make such a beautiful nose in so short a time! Briefly, it is a tremendous success. If I return to Paris, as I hope, I will certainly come to see you.—François Gorall, September 6, 1918. Madame: I surprised my parents with my mask and I can find no words to paint their delight; they could hardly believe it was I! You have done so much for me that I do not know how to express my gratitude, for it is thanks to you that I will be able to have my own home. My fiancée finds me not unpleasing and has not refused me as she would have had the right to do. She will soon be my wife.—Marc Maréchal. “All who enter here leave hope behind” was inscribed upon the portal of Dante’s Inferno. I would that a poet of genius might find the fitting inscription for Mrs. Ladd’s studio, where so many beings, secretly despairing, have found and will find supreme comfort. And once more the homage of our gratitude goes out to the American Red Cross, which has discovered here an incomparable and almost divine means of soothing one of the most poignant forms of human suffering. Mrs Daffodil’s Aide-memoire: On this Armistice Day we remember the service of veterans everywhere, and especially the wounded, who bear scars both visible and hidden. 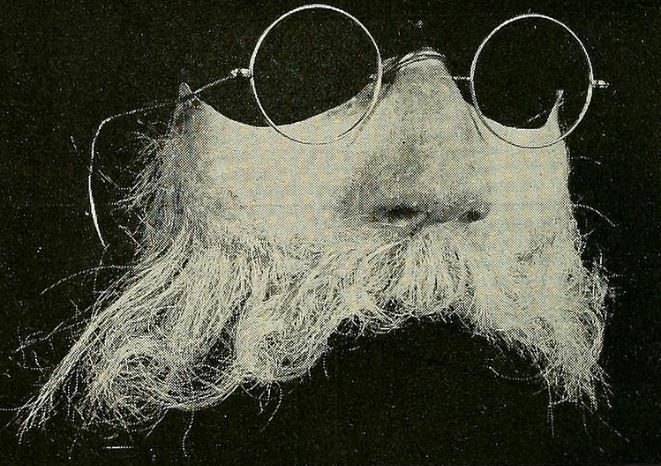 This entry was posted in Gentlemen, Grim and Grewsome, History 1910-1930, Medicine, News and Announcements, The Great War and tagged Armistice Day, French soldiers, Great War, mutiles, plastic surgery, restorative masks, Veterans Day, war wounds on November 11, 2016 by chriswoodyard. 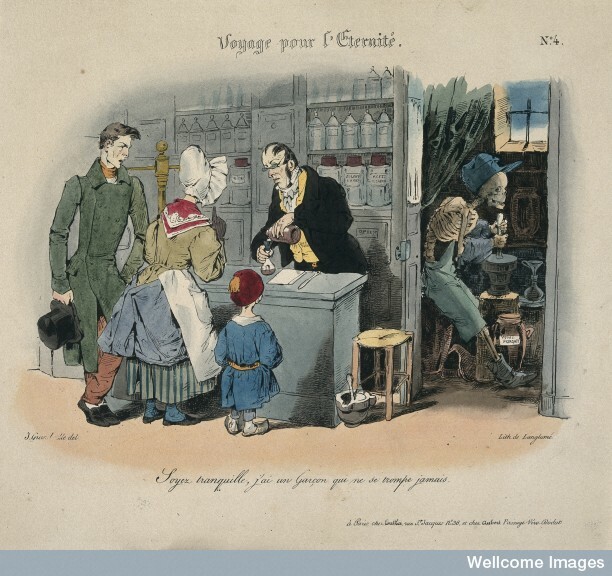 V0011779 Voyage to eternity; pharmacy scene with Death at work. Most people know from experience how long it takes to get a prescription put up at an apothecary’s shop when the occasion is pressing, but deliberate as are the clerks of pharmacists on this side of the water, they must yield the palm to their French brethren. The following translation of a little sketch by M. Charles Monselet illustrates our remark: The Pharmacy Blanc is one of the handsomest in Paris. In the first place, it is situated in a central quarter, that is to say, in proximity to the greater part of the accidents. The shop is large and airy, its windows are adorned with curiously shaped bottles filled with variously colored spirits; the interior is decorated with undoubted good taste; there were urns wherein serpents are coiled, dark green busts of Aesculapius and Galen, and copper sphinxes support the counters. I can never explain it to myself, but pharmacies have always a fascination for me, possessing. as they do, a methodical aspect and an exceptional atmosphere. From the powders, minerals, roots, plants, herbs, dried flowers, the unguents, patés, elixirs, there exhales an odor singularly pleasing to me, and amidst which I fancy I should like to live. All at once, while I was examining all those jars, so alike in appearance and so diverse in contents, a woman pushed open the door of the shop violently, and entered. She had hardly strength enough left to speak; her countenance was convulsed; she could only hand to the pharmacien a prescription which she held clutched in her trembling fingers. The poor woman sinks into a chair, her arms hanging listlessly on each side, and her face expressionless from anxiety and fatigue. Saying this, the pharmacien corks hermetically the little vial, which is at last full; he takes from a drawer a piece of green paper, with which he covers the cork, arranging its folds with a tedious neatness and regularity; he ties it with a bit of red twine, and trims the paper with a pair of scissors; then he plunges a stick of sealing-wax in the gas jet, and deposits upon the summit a lighted drop, in which he affixes the ends of the twine. In point of fact, after having accomplished all these indispensable formalities, the pharmacien rolls up the vial in an elegant quality of paper, and presents it to the woman. “How much? how much? ” stammers she, feeling for the money in the pocket of her dress. At the desk sits enthroned the proprietor of the pharmacy, with a majestic air, dreamily perusing the latest livraison of pharmaceutical literature; he detains the poor woman several minutes more, and at last she receives her change; then she precipitates herself towards the door, when she encounters again the clerk, who politely opens it for her, in the midst of a deafening rattling of the bell attached thereto. Such is the scene, dear neighbor, which I accidentally witnessed the other day. May Heaven preserve you from ever going to procure anything else in the Pharmacy Blanc than an agreeable sirup or some perfumed pastilles. Mrs Daffodil’s Aide-memoire: A very trenchant “slice-of-Parisian-life” anecdote. Mrs Daffodil knows that she will shock her readers by acknowledging that such delays may also happen in England, particularly if the unhappy widow-in-waiting has the misfortune to be behind a pretty nurse-girl ordering a soothing syrup for her charges from the elegant young pharmacy clerk. If such is the case, she might as well abandon the notion of curative potions and go straight to Black Peter Robinson’s. This entry was posted in Death, Gentlemen, Grim and Grewsome, Husbands and Wives, Medicine, News and Announcements, Professions, Victorian and tagged anxious wife, delays at the pharmacy, Parisian pharmacy, pharmacy on September 30, 2016 by chriswoodyard.